Your child is out playing in a game, gets a hard hit and falls to the ground. The ref blows the whistle and the coaches go to evaluate the situation. Your child says that he/she is “OK” and gets up. The crowd and players applaud, the game continues. In the back of your mind you’re wondering, is my kid OK? Well he/she wasn’t “knock-out” so it isn’t a concussion – wrong! 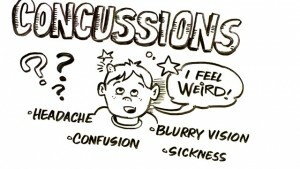 A concussion is a mild traumatic brain injury caused by a blow to the head/face or when the head or upper body is violently shaken. This type of injury can cause loss of consciousness but most concussions do not. People react to concussions in different ways. 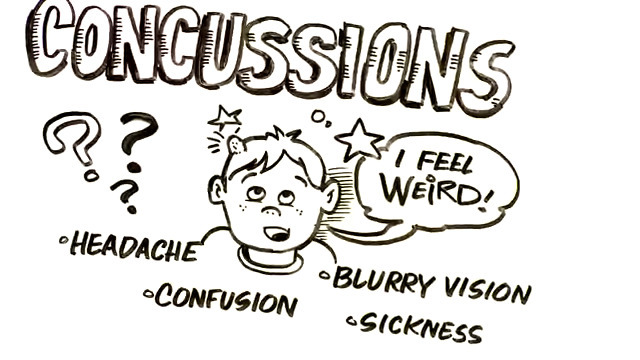 Many do not exhibit immediate symptoms but you typically see some of the following concussion symptoms within 72 hours after the initial trauma: unsteadiness or dizziness, vertigo, fogginess, confusion, nausea, neck and upper back pain, headaches, difficulty concentrating and vision problems. Current guidelines indicate that once an individual has a suspected concussion they should be immediately removed from play – why? Most patients with concussions – about 80-90% will typically recover within 3-10 days but some will require 2-4 weeks of treatment. What is most essential is that they do not suffer a “second impact syndrome”, another traumatic incident especially within the following 10-14 days following the first concussion. This 2nd traumatic incident may be a minor collision involving the shoulder, upper trunk, face or head and it will bring on additional symptoms greater than the initial concussion. This factor is a greater risk indicator for problematic post-concussion symptoms, having recurrent concussions and a prolonged recovery period. Post-concussion syndromes are much more severe and typically involve the previously mentioned concussion symptoms, walking and motor co-ordination problems, depression, anger issues, short-term memory loss and neurological impairments and can be devastating – even deadly. So with this in mind, coaches, parents and referees should evaluate the collision and determine if your child should be removed from play. Remember players involved in a collision may not have immediate symptoms and most competitive individuals will want to play to “help the team” or “win the game” and say “I feel OK to play”. 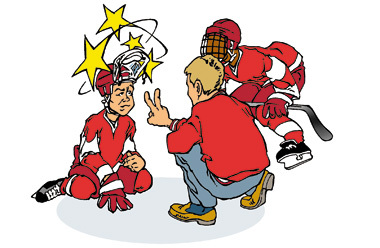 Considering the factors involved and that we are dealing with young athletes with minimal medical evaluation at the game, it is better to take a conservative approach and avoid the potential risk for second impact syndrome and dealing with post-concussion symptoms. If in doubt sit them out! So what should you do once your child has been removed from play and has been diagnosed with a concussion? The following is a step-wise recovery process requiring patience, attention and caution – patients should proceed to subsequent levels if they maintain no symptoms at the current or prior level for a minimum of 24 hours but each step could last longer. If symptoms arise, back up one level after 24 hours of compete rest and proceed again. Complete rest until acute symptoms resolve – this means no physical activity and mental exertion including no exercise, no school, no reading, no computer/tablet or smartphone use, no watching TV and no social contact. The importance of complete rest cannot be overstated. Light aerobic exercise less than 70% of maximum heart rate – walking, swimming or cycling. Sport-specific activities: jogging, skating, throwing, passing – there should be no head or body contact and no jarring activities or high speed stops. Non-contact training drills – more complex drills, faster speeds, can begin progressive weight-resistance exercises. Begin practice with full body contact – following medical clearance. Return to normal game play. In my clinical practice, I have noted that all my concussion patients had neck strains, joint restrictions and problems with hand-eye coordination and balance. Current research has determined that the biomedical forces needed to sustain a concussion (60-120 Gs – Gs=force of gravity) far exceed the forces involved in neck stains and whiplash (4.5 Gs). 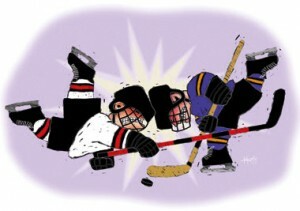 So patients that have had a concussion should receive therapy and rehabilitation. Current research suggests a multi-therapeutic approach involving chiropractic care, physiotherapy and massage therapy. Treatment typically involves joint mobilization, massaging neck and upper scapular muscles and fascia, hand-eye coordination exercises, vestibular and balance re-training. The study, published in the British Journal of Sports Medicine in 2014, found that 73% of athletes with prolonged concussion symptoms returned to play within 8 weeks of initial treatment after undergoing muscle and joint therapy and vestibular and balance rehabilitation compared to only 7% in the control group. This was great news confirming the link between concussions and neck strains/whiplash especially for more problematic cases.